Bishop Felipe Lozada-Montañez of the ELCA Caribbean Synod at the installation of ELCA Presiding Bishop Elizabeth A. Eaton. Technology pervades nearly every aspect of our daily lives — especially those of our teenagers — and yet we rarely talk about it in our congregations. People carry powerful smartphones, wonderous tablets, and they work daily on desktop and laptop computers. They are continually plugged into the Internet and social networks — technologies that have completely saturated our daily lives and work. 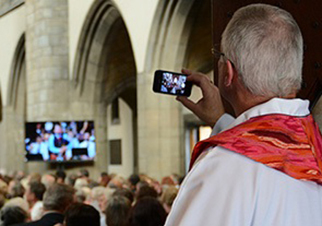 And yet, as pervasive as these technologies and digital media are, we don’t really talk about them in church. Why? Perhaps there is an unspoken presumption that these devices and networks don’t have anything to do with our faith. In fact, they powerfully shape our faith in ways we are often unaware of — both by the information we receive through them (how we are formed), and how we live out our faith in digital spaces (how we enact our faith). It may also be our own relative discomfort with understanding and operating these technologies ourselves. We can feel less than knowledgeable and outpaced (read: intimidated) by our teenagers. In this digitally integrated time, congregations need to take seriously and engage in conversation at the intersection of faith and technology for all ages, but especially youth. As our youth live more of their lives online, they will also live out their faith there. If we don’t engage it, we will miss out on a huge part of their lives … and leave them without spiritual guidance. Youth eat, breathe and live social media and texting in ways that are hard for even younger adults to comprehend. We are familiar with stories of bullying, unfortunate oversharing and the lasting damage it can do. At the same time, there is the potential for much good and grace, and youth can be the agents of that grace. To begin exploring this intersection of faith and technology, we watched a video. Then we read a great blog post titled “Gregory’s iPhone Contract,” which is an agreement a mom wrote for her 13-year-old son on the new iPhone he received for Christmas. The contract is filled with specific rules, but also great wisdom about living life in a digitally integrated world: good manners and etiquette, managing digital and face-to-face connections, what to share, and when to get off the screen and into the present moment. We divided the kids into small groups and asked them to look at three of the rules, discuss and report back to the larger group. Then we got into talking about how faith connects and opened it up for the kids to talk about what they see in their social networks, about how they are used for good or ill (sinners and saints), and how God might be present. The responses were great. Finally, we broke into groups and asked them to fill out a blank Facebook profile with what they’d like people to know about them — what to share and what to keep private, what part faith plays publicly or behind the scenes. We kicked off the session by watching a video and then returned to the empty Facebook profiles we filled in and asked what people wrote and if faith or God were a part of it and why. How do you live out your faith online? Was God a part of your Facebook profile? Why? Why not? How do you share your faith in the real world? How do you see others sharing their faith? Would you accept a friend request from God? Why? Why not? We watched a video on caring for others on social media. We broke into our small groups and asked how they would respond to the following five status updates. I’m so bummed! What gives someone the right to just stand by and watch you get put down? Is it that hard to stand up for what you know is right? So much for my best friend. OK — so I brought up all my grades, I’ve been to class on time every day for a month, and do they let me go to the concert, next Wednesday? Nope! Life isn’t fair! Wish I could trade in my parents. Like if you think there’s no way Jay should have been starting point guard yesterday. A sophomore starting over a senior the last game of the season?!! Get real, Coach! And now he’s all puffed up like he’s so special … random! Another bad day. Sometimes I wonder if it’s all worth it. I mean, it’s not like I have any friends. I’m just someone everyone can beat up on. Tired of being a punching bag. Does anyone care? So what am I doing Saturday night? I’m going to an event at church! Oh sure, that’s much more fun than going to Sam’s party, right?! Will I ever have the right to choose for myself? Not while I’m living in this house! What’s the big deal with this church stuff? Do you think God is real? I’m not so sure. Hopefully, these ideas and resources can help you talk with your youth about the intersection of faith and technology in their lives and help them become digital disciples and agents of grace in the challenging landscape of teenage social media. But however you decide to have the conversation, just have it. It’s a huge part of our kids’ lives and if we don’t talk about it, we will cede that space to someone else. How have you engaged your youth in conversations about faith and technology? How did you do it? What did you talk about? Keith Anderson is the pastor of Upper Dublin Lutheran Church, an ELCA congregation in Ambler, Pa., and is co-author with Elizabeth Drescher of “Click2Save: The Digital Ministry Bible,” a hands-on guide to social media for ministry. Find a link to Keith Anderson’s blog Pastor Keith Anderson at Lutheran Blogs.